It's Alive! was release four weeks ago and the last four weeks have been a bit of a blur. I thought I'd give you an update on how things are going. The orders are still coming in thick and fast, though thankfully slower now than I'm making the games. I've got ninety-seven orders, nearly a third of the whole print run, and it's only been out a month! Most of this week's order are as a result of my Geek of the Week thread on BoardGameGeek. I've now made thirty-nine copies, all but one of the original forty boxes I made in the run-up to the UK Games Expo. I've started another batch of boxes and hope to construct another six games this weekend, while The Wife is working. I've been averaging six games a week since the Expo, but we've had a few weekends away, and I've been away a fair amount for work during the week too. I need to step up construction, or those at the end of the list will have to wait a long time. Fortunately, the box-makers in London have come back to me with a quote, so I can pursue them to make some of the boxes for me. I can't afford to get all the boxes made, but I think I can afford one hundred and fifty of them, so that will allow me to break the back of the waiting list, as once the box is made it only takes forty minutes to make the rest instead of an hour and a half for the whole thing. That should up my production rate to at least twelve games a week. I've now shipped thirty copies (including those I sold at the Expo). As I finish a batch I contact the next group of people on the list of orders, so I'm getting through them. I've now got twenty-four ratings on the Geek for It's Alive!, ranging from 6 to 8.5. The average is 7.62 so when this gets up to thirty ratings this should debut pretty well in the rankings. Because there will be more copies of this available than Border Reivers I expect more ratings in the long run, and hence the Bayesian averaging will have less effect. We shall see. In other news Scott Nicholson of Board Games With Scott didn't especially like it (he's the only six rating), but he's only played it once, and with five players, which might explain his disappointment. In other news, Border Reivers is now the 1840th best games in the world, as another rating has come in. I'm BoardGameGeek's Geek of the Week this week, following in the footsteps of Yehuda (It's Alive! 's designer) and Luke who occasionally posts here. The Geek of the Week posts a potted bio, mine has a humourous error, and two truths and a lie. Random members then get to ask them questions and guess which is the lie. In other news I've received another submission and quite a lot of interest in Border Reivers, which is gone. The games I brought to Gamex to get feedback and play test were: Cutthroat, Dueling Dice, Battlin Bones, Hatchlings and Peg Leg's. Gamex is a game convention in Los Angeles. 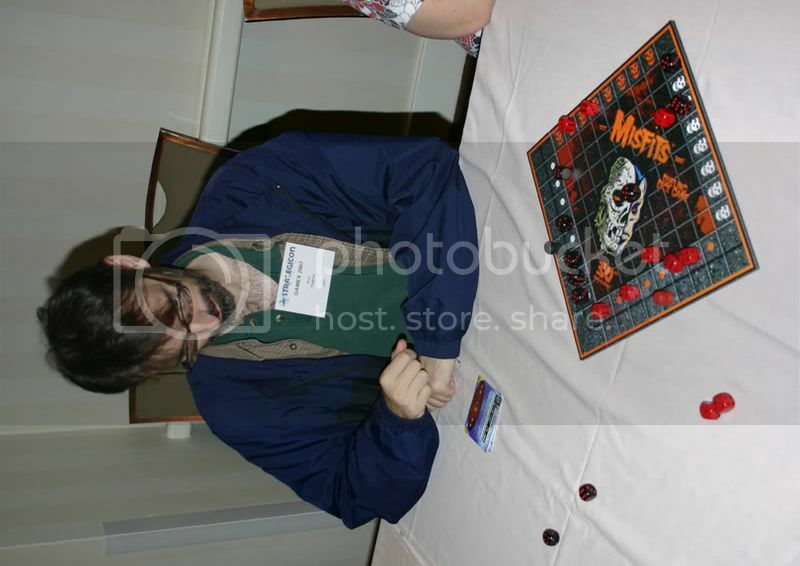 One of the three Strategicon conventions. Peg Leg's is a kids game so it was only played twice by one kid and one adult. The young girl who played it really enjoyed it and asked to play again but I had to run and do something else. The prototype of Cutthroat is made of wood and is very tactile so it got a lot of interest from passers by. We managed to play one 4 player game and I explained it to a lot of people. 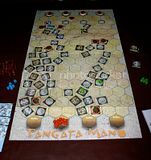 Although it's a very simple roll and move game, there's a lot of backstabbing and stealing so the players said they enjoyed that aspect of the game. Battlin Bones was played quite a few times and as I already knew, it needs some re-wording of some of it's cards. I was up pretty late typing them up so there were a few typos and I need to add MAY and MUST to a few of the cards. Hatchlings was never played but it was explained to few people. Dueling Dice was a hit i think. It's a very simple 2 player dice/board game. It can be played quickly and it can be played just about anywhere. I received a lot of positive comments about this game. A few play testers even helped me develop a 4 player version of the game. The 4 player version had a completely different almost Chaotic feel that was very exciting. 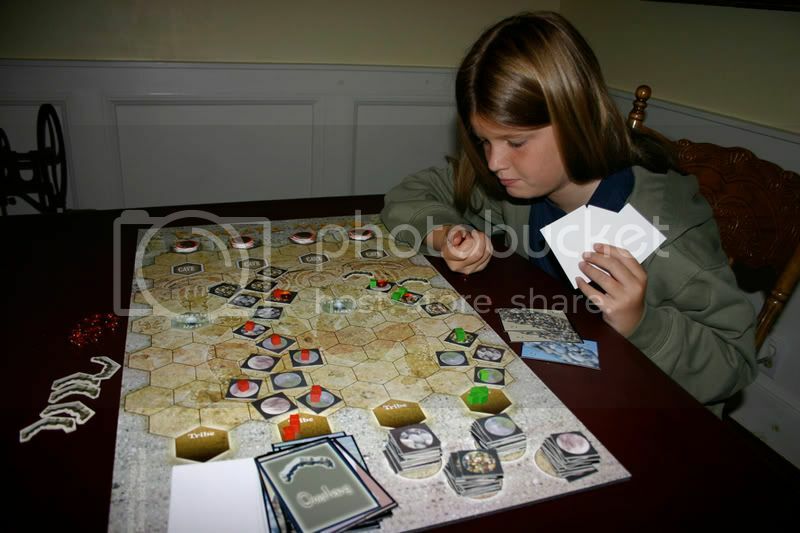 One of the play testers offered to buy one so I gave her a copy of the game board so she could put one together on her own. 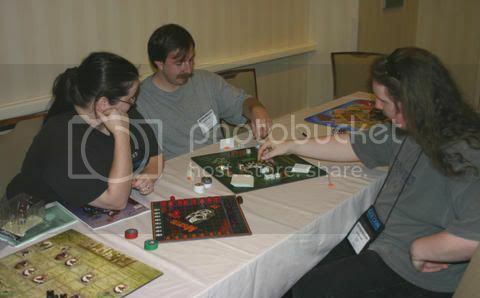 Here are a couple of pictures of people playing the prototypes. 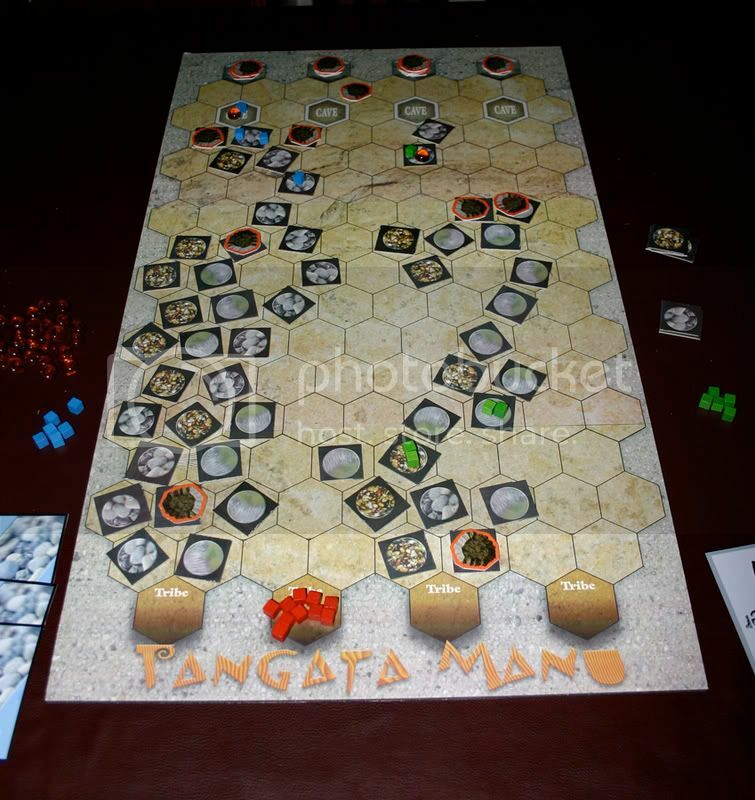 Here's the latest version of the Tangata Manu board. It has 2 less rows than the last version and I added the spaces for Draw and Discard piles. The game plays very nicely now. The original version took a long time before players started releasing boulders to squish the other climbers. Now it happens much faster. I also feel there is much more overlap of trail travel on this board. I don't think the game is too long anymore but I have only play tested it with two players and 3 players so far. I still need to try a four player game a few times. This would be too expensive for me to produce on my own so I'm about ready to start shopping it to publishers. I'm sure it will meet a lot of the same dead ends that my other games have run into. Border Reivers has finally got more than the thirty ratings needed to become ranked on BoardGameGeek. It is currently ranked 1861! The system of BGG rankings is intentionally biased against games with a small number of ratings to avoid small numbers of people (or indeed shillers) affecting the top ranked games. This is done using a Bayesian average - to get the ranking for a game the actual ratings are considered in addition to one hundred average ratings (the average rating for all games - currently around 5.3 I think). This means the thirty-one real ratings I have (average 6.9) are signficantly pulled down by the Bayesian spoof ratings. So please rate it! This is one of the reasons why I've done a larger print run of It's Alive! as the larger print run should mean more people get a copy and hopefully I'll get more ratings. That way the ranking should be less affected by the Bayesian spoof ratings. In other news I'm pressing on with the It's Alive! ordered copies and I've been revisiting Border Reivers. I had six copies of Border Reivers left at home: mine and five orders I've not sent yet because I'm waiting for the money. This week, two of those have gone - one to it's original orderer, and one to someone from my unofficial waiting list when one of the orders fell through. And another has started to move. I've only got four copies left at home. Weird. I've had the bits for it kicking around for nearly a year now, it's going to feel strange when it's all gone. I'll be very glad to have finished cutting out the tiles when that comes about though. As well as the remaining three copies (which are complete apart from their tiles) I also need to knock together another copy from the spares for another publisher who has expressed an interest. I've been watching the BoardGameGeek statistics for the two games I've published almost obsessively for months now, and it's interesting to see how they differ. Border Reivers has probably been listed on BGG for over a year now. It's been available for over ten months and sold out recently (though I'm still holding a few copies for people who have ordered). Border Reivers has twenty-nine ratings at the time of posting, almost to the thirty required for ranking. It's received generally positive feedback, with the odd person who doesn't like it: ratings range from four to eight out of ten. The average rating drop as low as 6.4 a while ago, but has been steadily increasing in recent months to it's current value of 6.88. Thirty-seven people are listed as owning a copy (I've shipped eighty-seven copies), and another twenty-two are listed as wanting a copy. Tangata needs to be shorter! Last night I play tested again as if it was a 3 player game. I started at 11:00pm and the game didn't end until 1:30am. That was with me making decisions really fast. I assume with a 4 player game full of people that haven't played it before we would be looking at a 3 hour game or more. I definitely need to shorten the game. 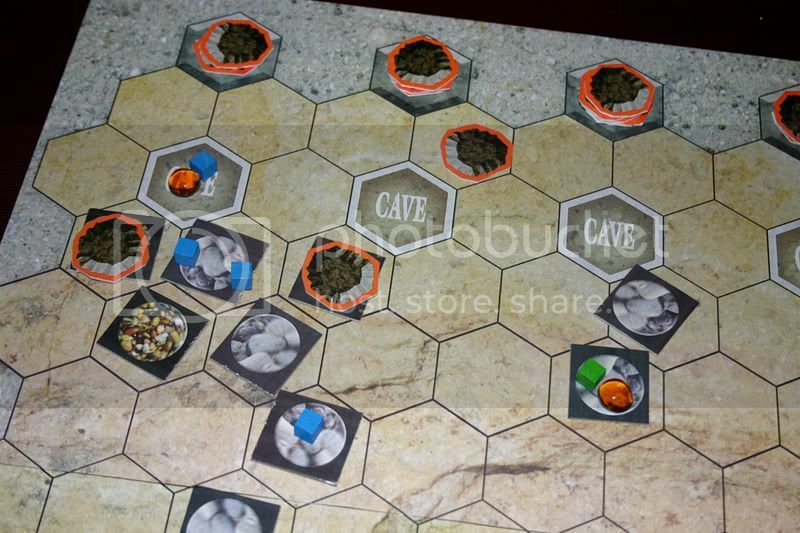 Blue won the game last night with eight tribesmen reaching the cave with 8 bird eggs in hand. 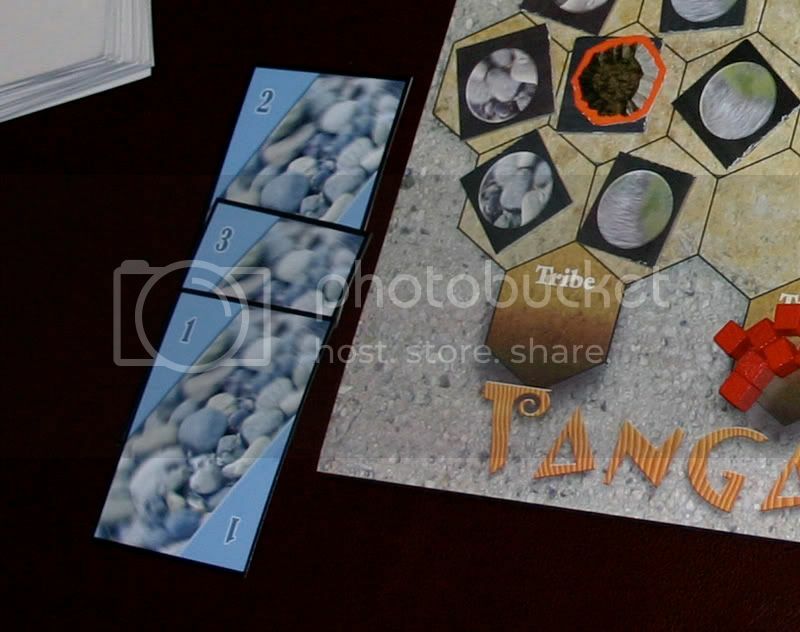 This new board is designed for 2 to 4 players instead of 2 to 6 players. I also changed the move generator from just cards to cards and trail tiles. This method of movement is almost dialed in and seems to work well but I'm still not happy with the boulders. As it is I've included boulder cards in the same stack as trail cards and I feel there are too many boulders taking out every tribesman that is scaling the cliff. If I just make less boulder cards then one person might control them all with the luck of the draw... that would not be good. I'm considering that the boulders should be a separate pile of cards and something should generate the ability to release a boulder from above. 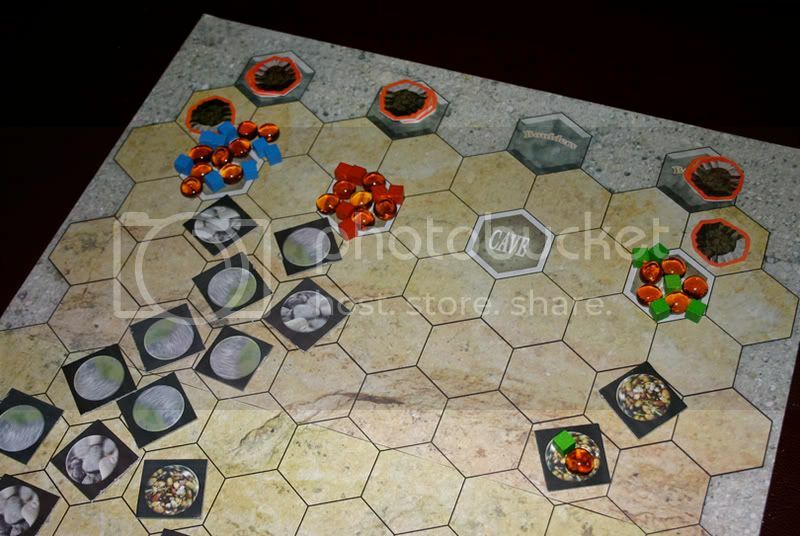 Perhaps each player gets 4 boulders and can choose to release them at any time - one per turn... ? I will be play testing different methods all week and will meet with some gamers on Friday to get their unbiased input. Here's a close up of some of the trail cards. Here's a close up of the start zone on the board. Here's a close up of the end zone... You can click on these images to make them bigger. These are just mock ups still. The artwork should obviously change. I just feel much better play testing with something that actually looks like a game. It's hard for me to get a feel for a game when it's just notes on paper or note cards. I've got over ninety copies of It's Alive! spoken for, not all sales, but the vast majority are. My problem is this: It's going to take me around 135 hours to make these copies alone. Assuming a conservative 5 hours a week that's twenty-seven weeks construction! I really need to speed things up. I've already mentioned how well the convention went, here I'll go into a little more detail about what went well and not so well. My stock levels were fairly poor. There were only a few copies of Border Reivers left and because I didn't get the artwork from the printers until Thursday morning I only had time to make twenty-one copies of It's Alive! Ten of those had been pre-ordered, one was for me, another was to be given to a distributor. That only left me with nine unclaimed copies. Nowhere near enough. I reckon I could have sold two or possibly even three times that many. Still, it was out of my hands, so there's no point grumbling about it. I supposedly had a square area 2.5m x 2.5m, and was expecting two round tables, one front left for demoing and one back right for stock. I decided fairly last minute to pick up the paper tablecloths I'd bought for the Border Reivers playtesting last year, they are a nice dark green - Reiver Games green as I like to think of it. I wasn't sure whether the convention would provide tablcloths, so I thought it would look btter than bare tables. In the end they did provide white tablcloths, but I think the green ones looked better. As before we piled up the stock, with one box open at the front showing the box lid to better effect, as well as showing the components. Dave had the idea of us going dressed as mad scientists and provided a bunch of knick-knacks to provide some set-dressing: a severed finger, bat, rat and a monster hand glove. These made things a bit more visually interesting. I'd also made some POS displays, an A3 one for the company and two A4 ones - one for each game. I made them from foam-core, with two stands to hold them almost upright and then printed some artwork on my A3 inkjet and glued it on. 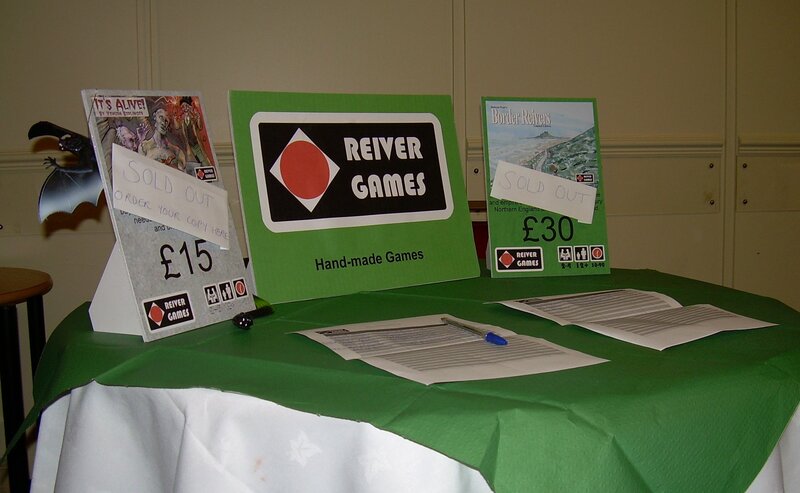 The company one just consisted of a huge logo and the tagline: 'Hand-made games', the game ones were portrait with the box background pattern, the box artwork at the top, a brief description, the price and the Reiver Games logo and icons at the bottom. I was pleased with these, the text drew people in to read them and they also allowed pople to find something out when we were all too busy to come over and talk to them. I booked last minute and so I didn't get choice of location. We ended up in a room tucked away in the labyrinth, hidden in a corner, but twenty feet from the bar. On arrival I was disappointed, but to be honest the location was fine. We had a steady stream of people and people were drawn into the room by the lure of food. We were offered a third table early on, but we didn't really have enough staff to man it, and we only had one demo copy of the game. It worked fine for us. 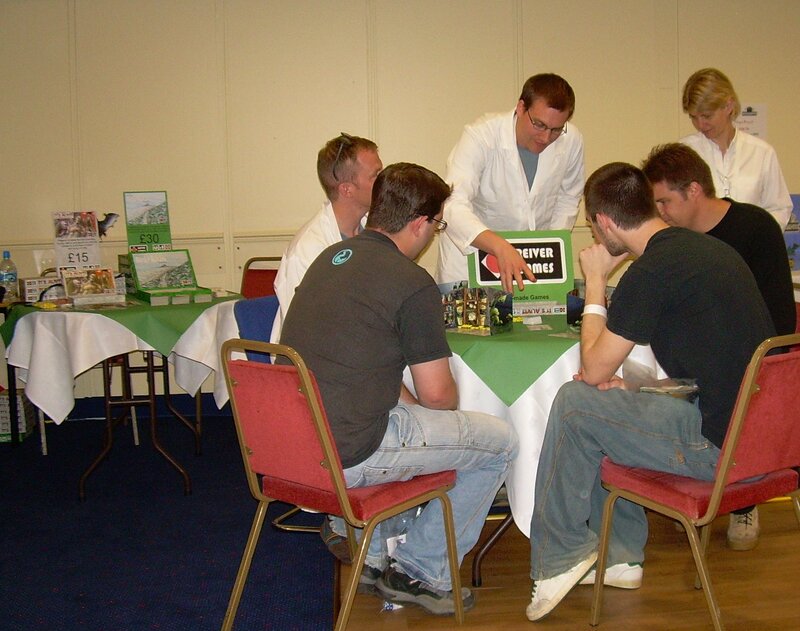 Dave had the inspired idea of dressing as the mad scientists of the game, and so we all went in lab coats and glasses. I had hoped to get wild white wigs, but I didn't have time in the end. The costumes were well received, and I think they definitely stood out more than the wealth of brightly coloured polo shirts which were the standard. I think the game was a perfect one to be demoing at the convention. It's short play time meant that whenever someone walking past looked interested we could say: 'Would you like a game? This one will be finished in ten/fifteen minutes'. The winning cry of 'It's Aaallliiivvveee!' drew interest from around the room, especially when done in Dave's best, booming, Hammer Horror voice. The artwork also sucked people in. Having a cheaper price also helped (£15 instead of the £30 for Border Reivers), but having said that Border Reivers sold out quickly too. I took Dave and The Wife to help out which was definitely a good idea. It meant at the busy point on Saturday morning we had enough people (just!) to cope with the rush, and at quieter times we had enough to have one person playing/explaining, one person floating and dealing with passers-by which allowed the third person to have a wander round, nip to the loo or in my case schmooze the tradehall. I've struggled on my own at smaller events, but there's no way I would have coped at the Expo on my own. Several pople asked for the website address or an email address - and I had nothing to hand out. Flyers would have been one option, but I dislike them for being so wasteful. I would have really benefited from having business cards. I received several from other people and it would have been good to return the favour. Also, they can just be handed out to people who are interested in a web address or contact number. I'm definitely going to get some before my next convention. 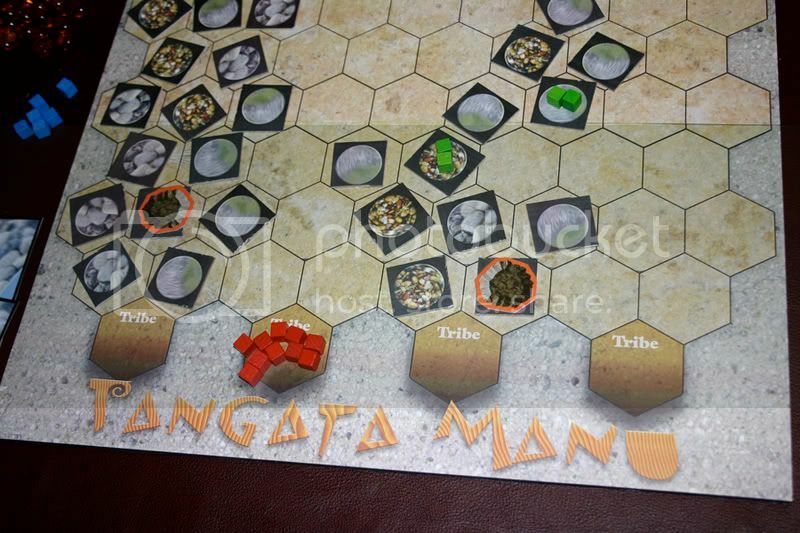 My initial concept for the Tangata Manu game was really simple. You are trying to move your figures up a cliff while the other players are trying to knock your figures off the cliff with large boulders. The winner would be the player that moves the highest number of his figures successfully up the cliff. The Tangata Manu ritual seemed like a perfect fit. The Tangata manu (the bird-man), is the winner of a traditional competition of the Easter Island people. The ritual involved swimming over to a small island and stealing some bird eggs and then swimming back and climbing up the cliff without breaking the egg. This game would be somewhat based on that ritual. 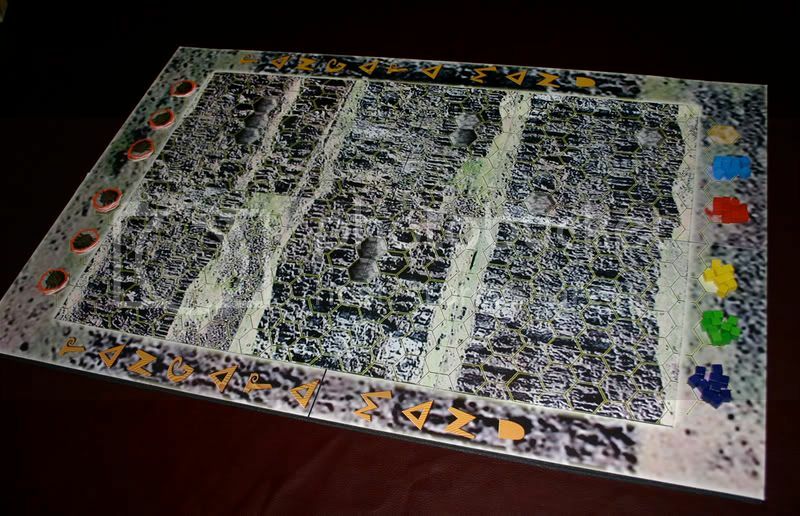 The game board represents the cliff. 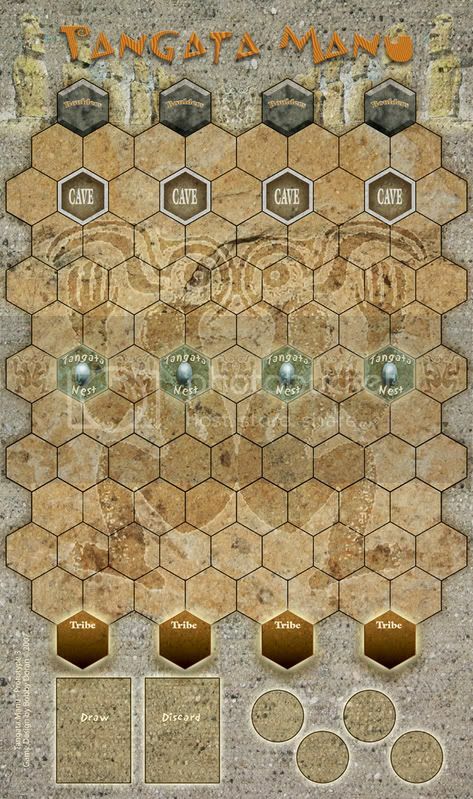 My initial design has 6 tiles that could be placed at random so the board would be slightly different each time. Each player has a number of figures (possibly 12) that he will move up the cliff. I started play testing it all by myself as 4 players and of course it didn't work as well as I thought it would. I know now the board is too big. The theme is there (not the artwork yet) and the basic game play concept is solid I think but it needs a bit of tweaking! First off - CONGRATULATIONS to Jack and Yehuda for the success at the con! 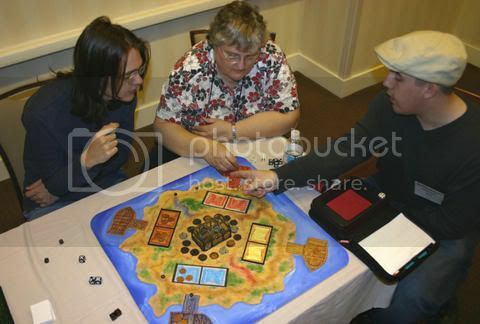 My name is Bobby Doran and I am a board game designer... For some reason that sounds like the beginning of an AA meeting. My daughters are still very young so I've created a bunch of kid's games to start with. it's a lot easier to get them to play test the simple games! And now I'm starting to move on to the more complicated themes. I'll use this post to bounce ideas off of everyone and keep you all updated with all of my game related successes and failures. 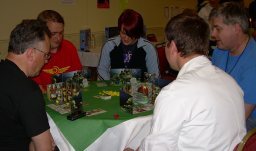 UK Games Expo A Huge Success! I've just got back from the UK Games Expo, and here's a very brief run down of what happened. When we got there (The Wife and Dave came with me) we were shown up to our room to find someone else in our spot. It turned out that things had been re-arrange the day before, we'd moved just round the corner - nearer the bar. It seemed like a quiet out of the way spot, but turned out just fine. I took the last six copies of Border Reivers, and twenty-one copies of It's Alive! : mine, ten pre-orders, one to give to a publisher who's going to try to raise some interest in the States and nine copies for sale. I hoped to sell out of It's Alive! at some point on Sunday, and sell a copy or two of Border Reivers - I wasn't even taking a demo copy of that, so I didn't expect to sell much. We set up, and within minutes (before the convention officially opened) we had a bunch of players for It's Alive! The table was never empty after that - there were usually people queuing to play. It seemed to be going really well, I started to sell a few copies. Plus a Border Reivers or two. Then it went insane. There was an hour or two when I was struggling to sort out sales, I had a queue of receipts to write. Border Reivers sold out (the last copy was nearly fought for! ), It's Alive! sold out. It just kept coming. We got rid of the last of our stock at 1:30pm on Saturday! Three and a half hours in. All we could do for the rest of the convention was demo the game and take orders (over twenty). An online game store pre-ordered twelve copies for stock. There was interest from the UK's largest games distriutor. A publisher was interested in Border Reivers. It was a fantastic weekend. I got eight copies made yesterday, way less than the twelve I was hoping for. Still, it means I should have at least sixteen to take with me. I reckon I can get another thirteen done today (I've got longer, and The Wife did a bunch of prep for me, bless her), which will give me a total of twenty-one copies to take. Since one of those will be mine (for demo purposes) and seven are ordered, that would leave me with an unclaimed stock of thirteen copies plus six of Border Reivers. Any I don't sell I'll use to start fulfilling the pre-orders. In other news we'll have a new member soon, Bobby Doran a Californian game designer who recently took five prototypes to a convention and had some interest from Jay Tummelson, of Rio Grande Games! Make him feel welcome!